Whether you’re just opening up a new Asian fusion restaurant or are thinking about embarking on a third location for your burger shop, as the owner, you’re handling a variety of different tasks. From distribution logistics to managing a staff, to ordering food and brainstorming a new menu, marketing may oftentimes be put on the back burner. But, in order to attract new customers, you need to be visible! We’ve compiled 9 ideas on how to easily incorporate marketing strategies into your business plan. You’ve already got many of these tools at your disposal – all it takes is a nudge (and maybe another free tool or two) to take you to the next level. This is an essential piece of the marketing pie. If you don’t know who your ideal customer is, how are you going to effectively advertise to them? FitSmallBusiness suggests considering a niche in order to set you apart from restaurants with the same cuisine. Are you a pizza parlor in a small college town? Get involved! You can become a sponsor of football games, offer back to school deals, and create lunch specials for students with a valid school ID. If your target age group is 18-22-year-old college students, chances are they’re engaging in social media and researching places to eat online. Some 88% of 18-29-year-olds use some form of social media. Individuals in this age group are more likely to use Snapchat, Instagram, and Twitter, and be surfing these channels multiple times per day. Consider social advertising and organically posting on these channels as a way to bring in new followers and customers. Food blogging and food influencing are extremely popular, especially on Instagram; who doesn’t want to look at amazing pictures of food all day? Food bloggers’ businesses thrive off of visiting new restaurants and showing off the cuisine you have to offer. They’re basically like walking, social media posting advertisements for a restaurant. Take advantage! Reach out to food bloggers and offer them the opportunity to dine with you in exchange for a feature on their page. Successful bloggers have thousands, hundreds of thousands, even millions of followers. Of course, it’s not guaranteed that they’ll post a positive review, but hopefully, they’ll be honest. Seeing that a favorite blogger enjoyed a meal at your restaurant can inspire their followers to visit you as well. Make sure the bloggers you’re reaching out to are relevant and in your surrounding area. 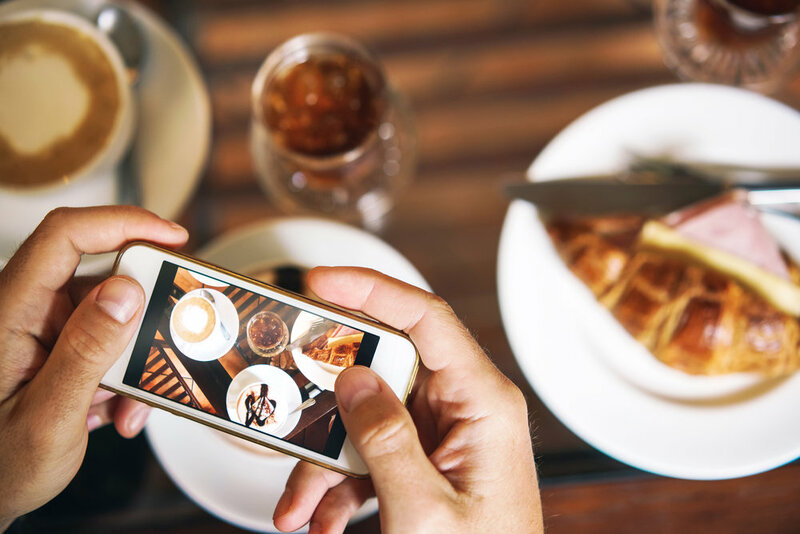 Follow local foodies by localized hashtags, like #indyeats or #nashvillefoodfan and look for users with the most followers or likes on their photos. This article from Forketers gives great advice on how to build relationships with these influencers. Not on Instagram yet? Then you are missing out on a free – and powerful – social marketing tool. Getting started is simple: make a recognizable username that is or is close to your restaurant’s name, then start posting away! We recommend having a solid amount of photos on your account before following others. People are more likely to follow you back if you have attractive, enticing content. This means high-quality photos! Blurry and unappealing photos can deter users from following you back. Buffer gives great tips for utilizing Instagram to its maximum potential. Put your “handle” (@example) on signage around your restaurant to let diners know that you’ll be posting exclusive sales and promotions to your Instagram account. Encourage customers to follow and tag you in posts. You can even run contests for diners who promote hashtags of your choosing. For example, promotion-driven hashtags like #HappiestHourAtJakes or #DrinksonDarbys on customers’ social accounts can help drive off-peak traffic and spread the word about your business. Ask customers to use the hashtag, as well as mention your handle & tag your location to get the most out of each post. If you’re feeling generous, you can offer a discount or free food/drink item to social media mavens who tag your location in a personal post. Dining starts digitally: 92% of people are reading online reviews! Like it or not, diners are free to voice their opinions about their experience at your restaurant. And other potential diners are most likely reading what these reviews have to say before deciding to visit you. Although you may want to, it’s not the best idea to ignore the reviews you receive, good or bad. Of course, you’re always going to receive a negative review here and there along the way. You know what they say, you can’t please everyone! But, that doesn’t mean you can’t address the not-so-nice reviews with grace. Learn how to deal with those here. You should make an effort to respond to the positive reviews, too! Diners took the time out of their day to praise your restaurant, so thanks are definitely in order. Keeping this open and honest conversation between you and your customers will help foster a long-lasting relationship. To take it a step further, review sites like Yelp allow you to offer customers “check-in” rewards when a diner checks in at your location on the site. This tool helps you build loyalty even beyond just responding to online comments. Google My Business (GMB) is an online listing tool to help local businesses get discovered on the popular search engine. As a restaurant owner, you want to be in control of your online presence! This means you have to claim your listing on Google to be recognized as the business owner. Wondering how? Read our guide. With a claimed GMB account, you’ll be managing how your business appears in Google search results & maps. Plus, you can monitor and respond to your Google Reviews, add photos, and create an accurate brand identity. Having a claimed business has its perks. According to Google, “businesses that add photos to their listings receive 42% more requests for driving directions on Google Maps and 35% more clicks through to their websites than businesses that don’t.” Make sure your GMB account is complete so you can start seeing the benefits! This time I’m talking about Facebook, Twitter, and Snapchat! Facebook has over 2 billion users worldwide, with 70% of American adult users visiting daily. Twitter has 302 million users, and Snapchat has great engagement from millennials, with 187 million daily users! You’re busy running a restaurant – who has time to post updates? You do, if you plan strategically! Want to promote your seasonal specials, limited time offers and happy hour events online? Schedule them ahead of time. SinglePlatform can post announcements immediately or schedule them on a recurring basis to match your schedule on your social media accounts and your menus on listings like Yelp and Google. So, no matter where customers are finding you, they can find your specials, too. Using a free tool like Hootsuite to post is also another opportunity to utilize this set it and forget it method. Snapchat is a great tool for immediacy. People love to watch Snapchat (and now Instagram) stories. Post updates throughout the day (think photos of your daily specials, any fun events happening, or employee features) to keep your customers engaged. Don’t forget to use photos! One study shows that photos on Facebook drove 120% more engagement. And tweets that include photos get more retweets and favorites. Facebook and Twitter each have their own reporting built into their business pages. Check out your Facebook Insights and Twitter Analytics every month or so to see which posts are getting the most love. You will start to learn what works for your audience so you consistently improve your strategy. Incentivizing your customers is actually fairly easy. Even if you do this digitally, you don’t need to sink tons of money into a custom app to rival Starbucks’. One-size-fits-all options like LevelUp and Belly allow users to pay on their phones and be rewarded for spending regularly with your restaurant, and are easily integrated into your regular system. Whenever I receive a free punch card or have a loyalty app from a restaurant (or coffee shop) I find myself wanting to return just to earn my prize! For me, it becomes a game of sorts to earn my way to the free or discounted item. Serving mostly old-school customers? No problem. Punch cards are still an affordable and effective option if you’ve got a lunch promotion like buy 5 get 1 free. You may still want to keep track of your customers’ rewards digitally since there’s a chance they may lose their punch card! If you’re able to quickly look up their name and points in your system, they’ll be happy to know they can still receive their free offer without having their card handy. First, collect emails addresses (with a newsletter sign-up button on your website, and even through surveys and sign-up cards at your brick and mortar location) – then use them! Email marketing is not dead, especially when it comes to local restaurants. 72% of customers open an email due to the discount it offers and 62% customers open due to the personalized subject line. Think strategically about how you can use email marketing not only to bring in new customers but to keep them coming back as well. Consistent, targeted email marketing is effective. When I first moved to New York City a few months back, I was excited to be able to have an abundance of lunch options at my disposal. I quickly discovered sweetgreen, a healthy chain offering salads and grain bowls that are both nutrition and environmentally conscious. I signed up for an account for online ordering and I received an email that highlighted their benefits, including credits to my account after a certain dollar amount spent and a free salad on my birthday (score!) These emails are pertinent to me because I enjoy dining at the restaurant and they reward me for doing so. Thanks to these communications, I’m always informed of any current offers or seasonal menus so I can plan my lunch trips accordingly. Be sure to appeal to the crowd when composing your emails. If your target audience is a crowd of game-day fans, send out a weekly line-up of games you’ll be broadcasting and an offer for a discounted bucket of beers or wings. If you’re serving families in the suburbs, remind them about your kids-eat-free night, or send them a “date-night coupon” for half-off a bottle of wine. If you’re in an eclectic urban area, consider hosting (and promoting) wine tastings or happy hours. Check out this article from Constant Contact for more restaurants doing email marketing right. You probably spent tons of time perfecting your menu design, from color to font and inclusion of mouth-watering photos. Of course, this is important, as it’s the first thing your customers will likely read when they sit down for a meal. But, have you thought about your menu being searchable online? With 93% of people reading menus prior to dining out, this is a must. People are looking at what you have to offer before even leaving their couch. You want to be searchable in the places people are looking for their next dine in or take out, whether it be Google, Yelp, TripAdvisor, or OpenTable. Having your menu available across a wide network of websites and social engines helps you to gain visibility online. With just a PDF of your menu on your website, you’re losing out on the chance to bring in new customers who’ve never seen your menu before. SinglePlatform data proves that 80% of our online menu views come from new customers, which means a huge opportunity for you! Recently, I was looking for macaroni and cheese in New York City. I typed in “macaroni and cheese near me” to Google in order to see where I could get some, quickly! I could see that the Kitchenette had macaroni and cheese on their menu directly from my search. The place had good reviews & was close to my location, so I was immediately sold! If the restaurant’s menu wasn’t searchable, I probably would have passed them up for another location. Hungry people like me are looking up specific food items and researching menus before choosing where to eat. Whether they’re typing it into a search engine, searching a review or travel site, or turning to social media, you cannot afford to lose business to a competitor over not displaying something that you already have – your menu items. Getting discovered for your menu items is important, but getting chosen for them contributes directly to your bottom line. According to OpenTable, 93% of consumers view a menu online before dining out. At SinglePlatform, our customers who have enabled online ordering and have an accurate and updated menu online see 73% more orders and 76% more revenue than businesses without correct menus. That’s a lot more bang for your buck. Want to learn how to get your menu online with SinglePlatform? Read our blog on how easy it is to post menus on our portal. As a small business, you want to promote the success of others that are also fulfilling their dream of being a business owner. There are hair salons, fitness centers, boutiques, and local markets who are also trying to bring in new customers. So why not work together? You can drop off flyers promoting discounts at these establishments in hopes you’ll get some old-fashioned paper promotion (and return the favor at your restaurant, of course). You can even consider hosting an event together in order to drive awareness to both businesses. Charity auctions, tricky trays, and other sponsored events are great ways to bring a local community together. Have a market or farm nearby? Utilize their fresh products in your recipes. Then, recognize the farm, or even specific farmer, for their work. Being descriptive on your menu by shouting out the name of a local farm can help make the meal more enticing, too. Plus, supporting your local agriculturist shows that you support sustainability and care about your ingredients. You can even recognize these local businesses on your own social and email marketing platforms. Mention a different business each month in your newsletter, or do a local business feature on your social accounts. Ask the owner if you can tie this initiative to a promotion at their shop (for example: use this code to get 10% off your next bouquet at Kay’s Flowers). With all of the other responsibilities you have as a business owner, marketing can seem like a large feat. But, in order to drive new traffic & keep loyal customers, you need to implement marketing strategies. Don’t worry, it doesn’t have to be complicated! Take these 9 tips into account when looking for new ways to advertise your business. Of course, you always need to leave room for improvement. You may run a social campaign & not see much traction, or host an event that isn’t as well-attended as you thought. There will be times of trial & error, but this is a great learning experience. Testing out different strategies will help you to find out what works for you, so you can do it again! For additional restaurant tips, check out our ideas for seasonal success.